I hadn’t intended to return to the subject of artist Harry Bennett so soon, less than a year after I highlighted his fine work on Frank Kane’s Johnny Liddell novels. But his illustration for the 1962 Permabooks edition of Start Screaming Murder, by Talmage Powell, has been beckoning from my cover files for the last couple of weeks. And there is no good reason to ignore it any longer. 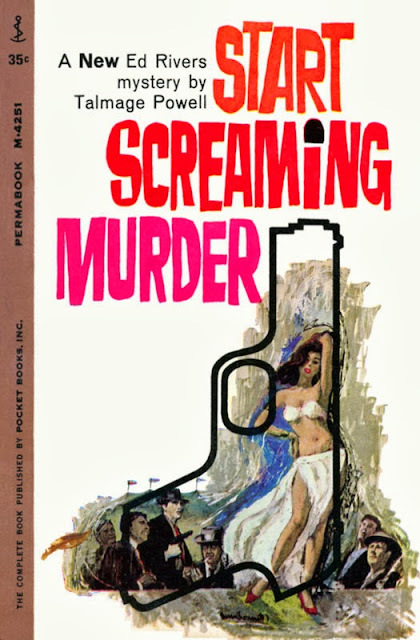 I mean, the jacket shown above has everything: a bonny, underdressed danseuse; mobster types enjoying the floor show with their fedoras, pistols, and libidinous desires; a distinctive, hand-drawn title; and if it’s not obvious from those components that Start Screaming Murder is a novel of crime and detection, Bennett has superimposed the haunting outline of a weapon over his central figures. It must have taken superhuman restraint for a fan of Powell’s fiction, happening across this novel on a spinner rack during the Kennedy era, to decide there was anything more important to do with his 35 cents than snap it up. Bennett (who, at age 90, is still with us) knew just what crime-pulp readers wanted: flesh, fear, and firearms--not necessarily in that order. 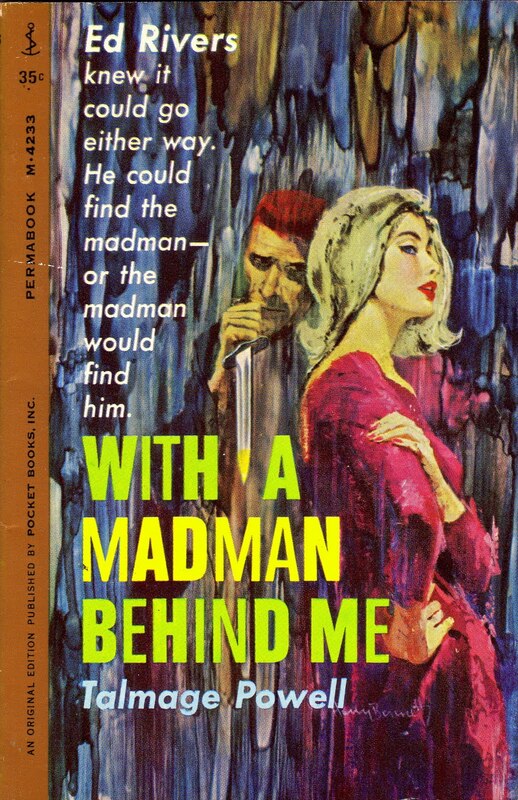 No wonder Permabooks hired him to create at least one more Powell book front, for its 1962 paperback version of With a Madman Behind Me. Ed Rivers lives alone in a small apartment in a run-down neighborhood on the edges of Ybor City, as the Latin Quarter in Tampa, Florida, is called. Ed, who is in his early forties, has brown eyes and brown straight hair thinning at the crown. He is six feet tall and weighs approximately one hundred and ninety pounds. His face is heavy, bearish, dark tanned and creased. “Women either get a charge from his face or want to run from it. Men fear it or trust it to the hilt” [writes Powell]. Ed’s office in downtown Tampa has a sign on the doors which reads: Nationwide Detective Agency, Southeastern Office, Agent in Charge: Ed Rivers. Ed carries a .38 plus a knife in a sheath at the nape of his neck and he knows how to use both. Like most competent P.I.s, Ed has a friend at Headquarters--Lieutenant Steve Ivey who helps whenever Ed needs a buddy in blue. Ed’s office is in two parts--an outer office with a cracked leather couch and matching chairs and an inner office that has a desk, a filing cabinet and a beat-up Underwood typewriter. The building is old and gloomy and the stairs creak under Ed’s weight. Ed makes his own air-conditioning for his apartment--he puts a 25-pound block of ice in a dishpan, the pan on the table and an electric fan behind the pan pointed at the bed. Once upon a time, seventeen years ago, Ed was a cop in Jersey. Ed also had a girl but she took off with a hood that Ed was after. They raced a fast freight train to a crossing and lost. After drinking and drifting for several years, Ed wound up in Tampa working as a stevedore. Then Nationwide gave him a chance and he took it. He’s been at the P.I. business ever since. I had gone through a lot to get that belt. I had consorted with midgets and freaks. I had been lied to, framed, been offered the bribery of a beautiful but depraved normal-sized woman’s body. I had also been beaten senseless twice, another time left for dead, locked in the trunk of an abandoned car. And now I was home, free. “It’s a long story,” I said. I thought about it for a moment. “It began with a beautiful little doll who stands three feet tall. Unhappily she had an ache inside her almost as big as she imagined the rest of us to be. Author Powell’s own story began in tiny Hendersonville, North Carolina, where he consumed his first tentative breaths in 1920. He went on to attend schools in that state as well as in Tennessee, New York, and California before studying writing at the University of North Carolina. Powell began his fiction-creating career in 1942, selling his work mostly to the pulp magazines. “I just assumed early-on that I would grow up to be a writer,” Powell told an interviewer in 1997--three years before he died at age 79 in an Asheville, North Carolina, hospital on March 9, 2000. “I can’t identify any specific inspiration, or reason, for that state of mind. I received my first blush with ‘publication’ when I was in the fifth grade. I wrote a little story as an English assignment and the next day the teacher varied the usual daily routine to read the story to the class and invite discussion. “The pulps were an influence simply because they were there, a voracious market, said to consume a billion words a year. “Magazine fiction in those days supplied entertainment in proportion comparable to TV today. Editors were under constant pressure to fill their ‘books’ (they never referred to the publications as magazines) with stories that would retain and expand their readership in viciously competitive circumstances. Powell certainly knew how to produce quickly, but he was also able to write at a discernible cut above many of his contemporaries. Over the next half century, he peddled dozens and dozens of pulp short stories under his own moniker as well as the pseudonyms “Milton T. Lamb,” “Robert Hart Davis,” “Ann Talmage,” and others. He contributed to such “books” as Black Mask, Hollywood Detective, Ranch Romances, Fifteen Western Tales, and Dime Mystery, turning out yarns in pretty much every genre. (“I thought of genre in broad general terms, ... and enjoyed writing in any terminology,” the author said.) “After the demise of the pulps,” explains an article in the Golden Age of Detection Wiki, “Powell continued to write another 300 plus short stories for fiction magazines such as EQMM [Ellery Queen’s Mystery Magazine], Alfred Hitchcock’s Mystery Magazine, Mike Shayne, Manhunt, and Suspense.” He also penned stories and screenplays for television, ghost-wrote the first two books in Ellery Queen’s Tim Corrigan series in the 1960s, and even composed a couple of novels (1969’s The Priceless Particle and 1970’s The Money Explosion) as tie-ins with the popular TV series Mission: Impossible. What’s more, he concocted non-series crime works such as The Man-Killer (1960), The Girl Who Killed Things (1960), and The Raper (1962, credited to “Jack McCready” and with a cover illustration by Rafael De Soto), as well as western novels such as The Cage (1969). By coincidence, I was planning to do a "forgotten books" post this week about one of the Ed Rivers novels, but I didn't have time to reread it. Maybe one of these days. . . .
Another pulp author I need to check out. Thanks for sharing. The Ed Rivers series have now been released as ebooks from Prologue Books. Also, a couple of Talmage Powell's Ace novels have been released as well. Also, Prologue have also put out ebook versions of books by William Campbell Gault, Peter Rabe, Vin Packer, Robert Colby, Orrie Hitt and Frank Kane. with a website coming soon. Harry is a close friend. I haven't seen him for over a year because he moved to the east coast (he used to live in Astoria). I will have to download this post somehow and copy it to send to him. He would enjoy it but he doesn't have email..